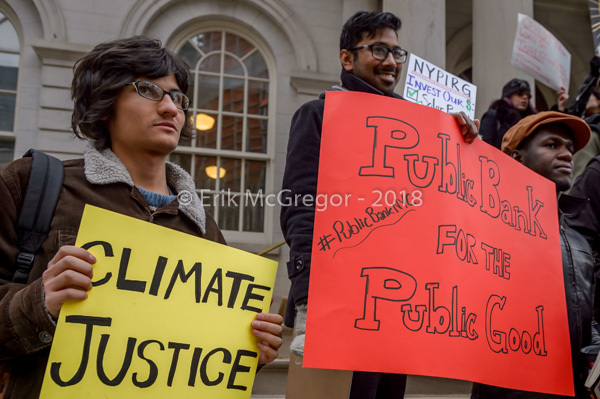 NEW YORK, NY – As global leaders assemble for the 4th Annual Climate Finance Day, New Yorkers, including representatives from environmental, community and student groups, held a rally at City Hall on November 28, 2018 and call on NYC to divest public money from banks that fuel climate change and to establish a municipal public bank to help fund the transition to a just, sustainable economy. 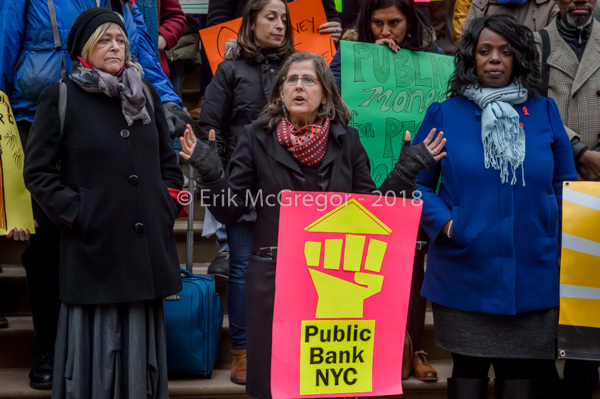 At the rally, Public Bank NYC, a broad-based coalition of community, worker rights, environmental, and economic justice groups, will release new findings showing nine of the largest banks eligible to hold City deposits (“NYC designated banks”) are major investors in the fossil fuel industry, including the proposed Williams Pipeline, which would carry fracked gas across the New York Harbor. 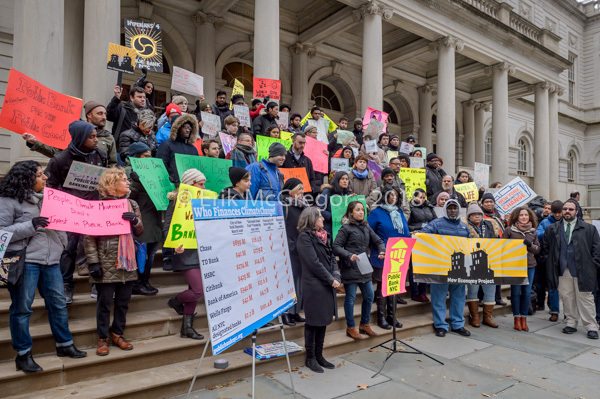 Speakers included representatives of American Indian Community House, Chhaya CDC, Lower East Side People’s Federal Credit Union, New Economy Project, New York Communities for Change, NYPIRG, NY Working Families, South Bronx Unite, and more. 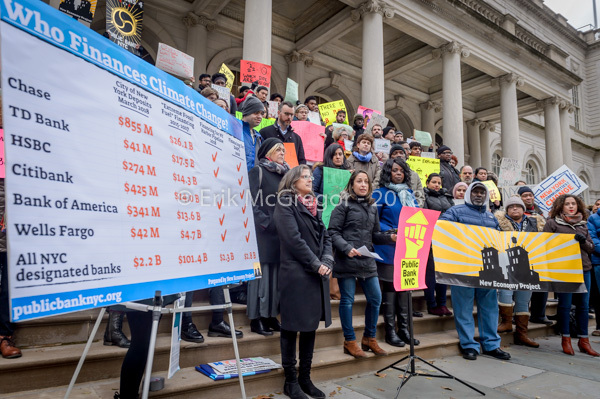 NYC’s elected leaders, including Mayor de Blasio and Comptroller Stringer, have committed to taking important first steps to divest NYC’s pension funds from fossil fuels and invest billions in clean, renewable energy. The recent United Nations report on climate change is unequivocal: rapid, dramatic changes are needed across our economy to prevent climate catastrophe. The urgency of the moment, though, demands we go much further. 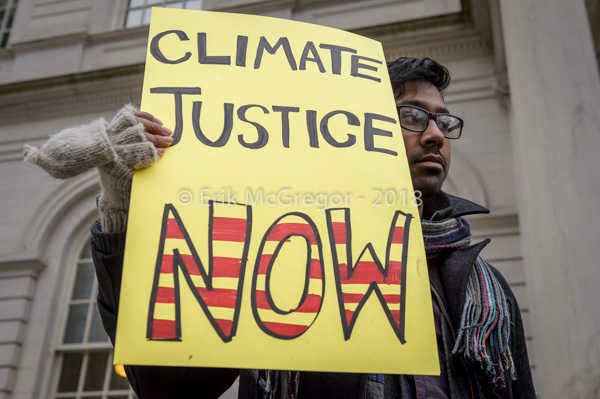 Five of the largest banks holding City deposits – JPMorgan Chase, Bank of America, Citibank, HSBC, and TD – lend tens of billions of dollars annually to fossil fuel companies, exacerbating the climate crisis and imperiling our future. The City’s top banker, Chase, is Wall Street’s largest backer of extreme fossil fuels. 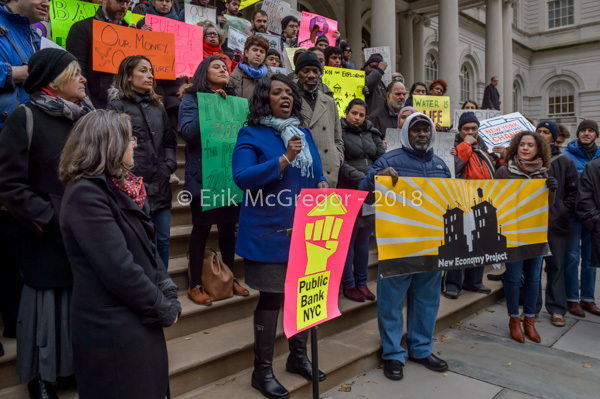 New Yorkers are demanding that public money be used for the public good, not private gain. 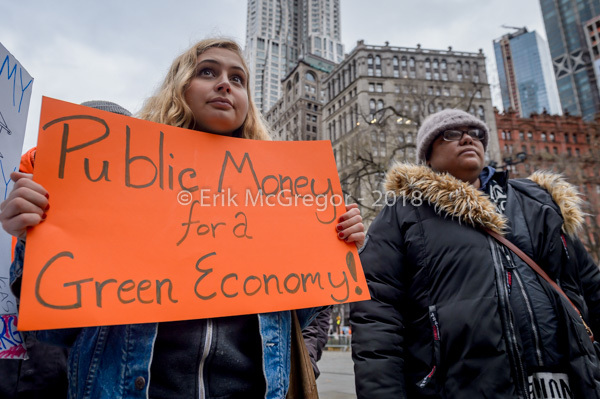 The alternative is clear: We must divest from banks and other corporations with business models predicated on extraction, and invest in sustainable solutions rooted in racial, economic, and environmental justice. 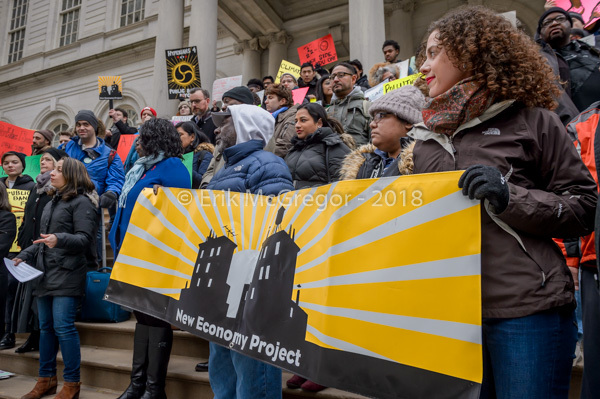 A public bank for NYC would support community self-determination as well as strengthen and expand community-led renewable energy projects around the City. It would be a vital step towards building a new, green economy, block by block, neighborhood by neighborhood.